Obvious, green screen CGI laces every sequence. Symbolic, ghostly images embed themselves in the eye of the storm. Faceless actors spout bad one-liners. Those same actors trade dialogue with fake southern accents. Villains snarl, growl, and yell on cue. Death occurs by whizzing hubcaps. Welcome to The Hurricane Heist, my latest write-up. 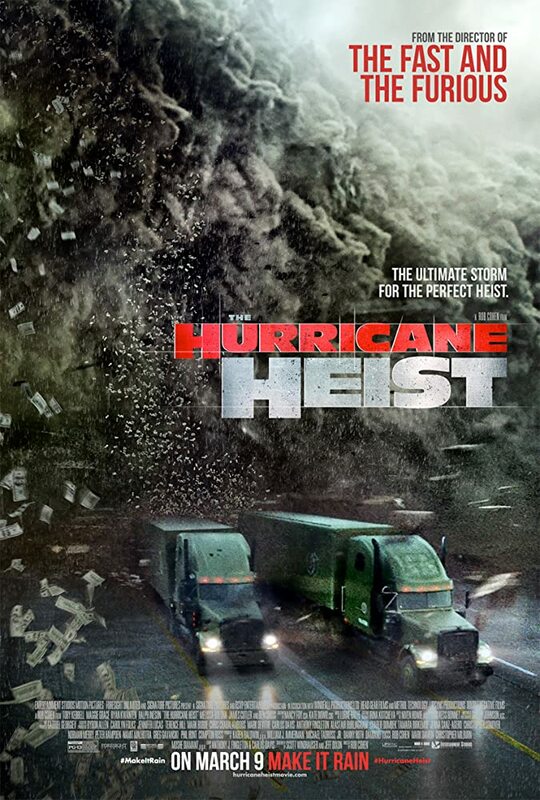 Taking place in Alabama yet shot in Bulgaria (I'm not kidding), "Heist" tells the story of a plethora of thieves trying to rob the U.S. Treasury during a Category 5 hurricane. As the film concludes, said hurricane looks more like an F5 tornado as opposed to anything else . The Hurricane Heist, which feels like it avoided direct-to-video territory simply because director Rob Cohen was attached, uses the line "harsh" in a pivotal clip and it's unintentionally laughable. Principally, "Heist" is a combination of Hard Rain with added 100 mph winds, Die Hard with bad weather, and 2014's Into the Storm minus any criminality. Of note: There's a scene in "Heist" where two trucks are driving away from stormed destruction in side by side fashion. One truck containing the bad guys gets hurled a thousand feet in the air while the truck containing the good guys drives away unharmed. Oh Hollywood, you never disappoint. Anyway, "Heist" actually gets off to a promising start. And although complex, it surrenders to sloppy editing, jerry-built concatenation, cluttered action set-ups, and a darkened look that suggests that the camera lens needed to be cleaned thoroughly. In truth, "Heist" is not the worst movie ever made. However, it fails to be cheeky enough to meet the merits of say, the midnight movie circuit or any kind of drive-in fodder. All in all, Rob Cohen was more proficient progressing his characters and their unhinged stunts via 2001's The Fast and the Furious. With The Hurricane Heist, he takes unknown troupers Toby Kebbell, Ryan Kwanten, and Ralph Ineson and keeps them from being anything but continually unknown. Rating: 2 stars.